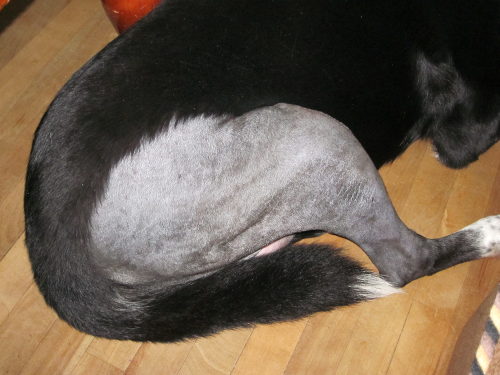 Yesterday marked the removal of Nuala’s staples. She’d finished her cocktail of medications on Wednesday, and since then, had been increasingly restive. I think as least one of the medications was to calm her down. Nu doesn’t like to be this inactive. She likes her morning walks, chasing her ball, wrastling on the floor. After her meds were done, she wanted to get back to her normal routine. This was challenging for my mom. She called late last Sunday to suggest that we bring Nu over and that she keep her enclosed in the basement. As Nu became more active, this became more demanding. On Friday, Nu jumped onto the bed that Mom has in her basement. She hadn’t even attempted it any time in the year previous. She might be feeling better, but she’s not supposed to run or jump at all. Try to tell her that. I’m not talking hotel rooms; I’m talking about the ways that we’ve had to rearrange our lives to accommodate Nu’s recovery. We have a small house, so limiting her activity isn’t too difficult in general, but we do have stairs that lead into the house and so bathroom breaks have been somewhat of a challenge. We’ve been trying to help her up the stairs by slinging a towel around her abdomen, but lately she doesn’t have the patience for it. While she was on the medication, we had to make sure that we administered it at the proper times and dosages. Since walking was out, we had to make sure that she had relief before we went to work. Nu’s a dog of habit and she doesn’t like to do her “business” in the yard. She prefers to decorate the yards of others so I can show my love for her by cleaning up after 😛 This last week has been one of the coldest in Sudbury for the past few years. Waiting outside, impatiently, for Nu to realize she had to choice but to drop a deuce in the yard was a B-triple-R challenge. Our dog has the run of our house. Normally, she sleeps on the bed (until it gets too hot) or on the couch. These are two of her favourite places. Because she’s not supposed to jump, we’ve had to get creative. The couch isn’t so bad. We can pull the cushions down and she won’t try anything. The bed’s a different story, though. We have a king-sized bed with a pillow top mattress. Before Nu started to show signs of lameness, it was really high. Neither Phil nor I had to sit down much to get in it. When she was initially diagnosed with arthritis, Phil cut the legs off the bed, shortening it by six inches so that Nu could hop in again. We’ve noticed something, though. When we have laundry out on the bed, Nu won’t go near it. So for the last week and a half, we’ve left the laundry spread on Phil’s side of the bed and he’s volunteered to sleep on the couch nights. See, if we were just to go to bed as usual, Nu would be tempted to jump up. She used to leap right over Phil to get into her preferred spot between us. Then sometime in the night, she’d hop down again. You see how we have a problem with this. We have to work some new system out, though, because Nu will be under restrictions for at least three more weeks. It takes six to eight to heal bone completely. Unless something bizarre happens, you can expect pup-related silence for the next three weeks. Our next appointment is February 16th, so I’ll catch everyone up then.